Former Florida Governor Jeb Bush is making his first trip to Iowa since making it clear he’s laying the groundwork for a 2016 presidential campaign. Bush touches down in Iowa later today and his first event will be a fundraiser at Living History Farms for Republican Congressman David Young. Tomorrow he’ll be among the potential presidential candidates to speak at the Iowa Ag Summit in Des Moines. During a conversation today with Radio Iowa, Bush talked about his campaign experiences here in the 1980s, when his dad was running for president. And Bush rejects the idea there is a level of “Bush fatigue” in Iowa. Some conservatives dismiss Bush as a “moderate” and cite Bush’s support of immigration reform and his advocacy of so-called “Common Core” standards for American schools. Bush cites his “Florida record” as a rebuttal to the accusation that he’s too moderate to be the party’s presidential nominee. 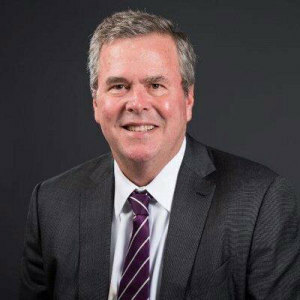 Bush became Florida’s governor in January of 1999 and left office eight years later after creating what he describes as “the best business climate Florida had ever seen” with over 1.3 million “net” new jobs created. Wisconsin Governor Scott Walker and New Jersey Governor Chris Christie — two likely competitors in the Republican presidential contest — make the same “purple state” argument, touting their ability to govern in states where Democrats have dominated and Democratic presidential candidates are routinely General Election winners. And Bush said he does not plan to accept “the narrative” that he said it being written, suggesting he will be unable to win over segments in the Republican Party who reject any candidate willing to discuss immigration reform. Before any discussion of granting legal status to those who entered the country illegally, Bush said priority one should be border security. During his conversation with Radio Iowa this morning, Bush also commented on the controversy surrounding the private computer server Hillary Clinton used for her email when she was secretary of state. Bush, as Florida’s governor, used a private email account and personal server. He still encourages people to send messages to that jeb@jeb.org address, but Bush indicated that, if he’s elected president, he would not use a private email account.